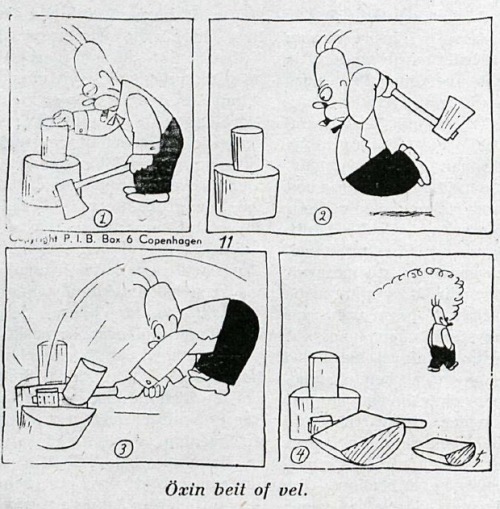 A cartoon of the 40s reflected a character remarkably similar to Homer Simpson by Matt Groening .. The Danish website has rescued a comic 22words Swedish Oscar Jacobsson looks incredibly whose hero Homer Simpson by Matt Groening. The personaj, and named Adamson, reflects a strong resemblance to his twin Springfield, not only for their physical appearance but also by the features that characterize it: stupidity and laziness. Adamson was also prone to vice, only instead of beer enjoyed by Simpson, if a smoker of cigars. Jacobsson began publishing stories about Adamson in the 20s and his character exported to several countries in Europe and even China, Japan and the United States.